Born into the Anglo-Irish landlord class with a strict evangelical Protestant mother, she became an influential figure in the Irish Literary Revival. She associated with many key writers and artists and made her home into a meeting place for cultural and literary figures such as W.B. Yeats, John Millington Synge, Æ, Sean O'Casey, George Bernard Shaw, and Katharine Tynan. Married Sir William Henry Gregory in 1880, hence known as "Lady Gregory." 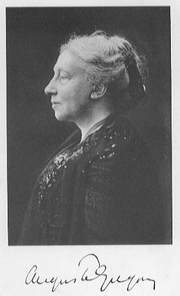 Lady Gregory is currently considered a "single author." If one or more works are by a distinct, homonymous authors, go ahead and split the author. Lady Gregory is composed of 23 names. You can examine and separate out names.